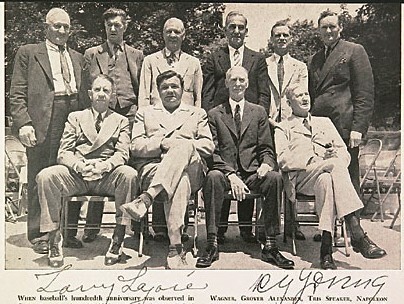 This picture of the HOFers at the 1939 Induction features forgeries of Nap Lajoie and Cy Young. 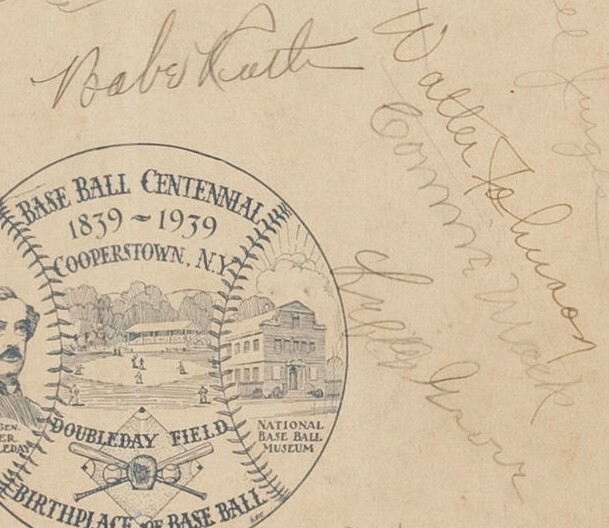 As “Operation Bambino” continues into 2012, readers have been alerting us about scores of other suspect autographed items certified as authentic by the “third-party” authenticators, PSA/DNA and JSA (James Spence Authentication). The revelations in the first three installments of Operation Bambino have stirred up quite a bit of controversy in the hobby as the accuracy of authentications of the high-end Babe Ruth single-signed balls are being seriously challenged by experienced collectors and dealers. 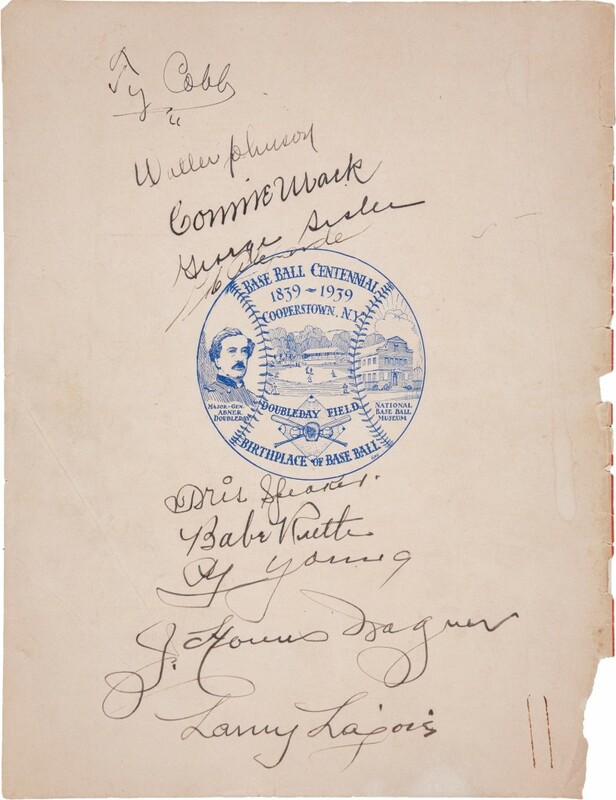 While Babe Ruth’s signature is considered the crown-jewel of the autograph industry, signed items from the 1939 Baseball Hall of Fame Induction Ceremonies in Cooperstown are also held in high regard by collectors and command top-dollar . However, based upon some recent sales of Induction autographs at auction, it may be necessary to follow up the Ruth investigation with a seperate ”Operation Induction” probe. The results of our cursory review of several items was, to say the least, shocking. This autographed 1939 Induction Program sold for over $40,000 at Heritage last year. Experts say its the work of a skilled forger, as there are tell tale signs of forgery. We asked some experts and dealers for their off the record opinions on the authenticity of the signatures on this program and all of them concurred with our conclusion. 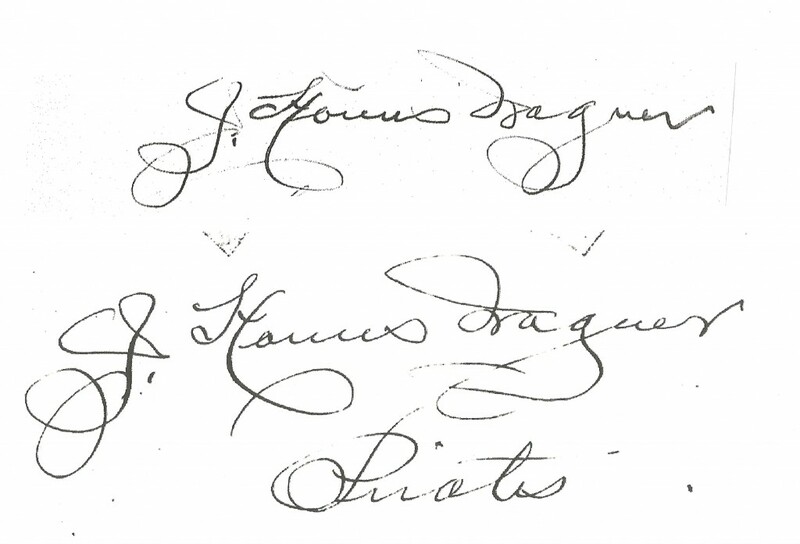 While some may still argue these signatures are genuine, as a result of the high quality of their execution, others were not fooled and noticed the tell-tale signs of forgery. 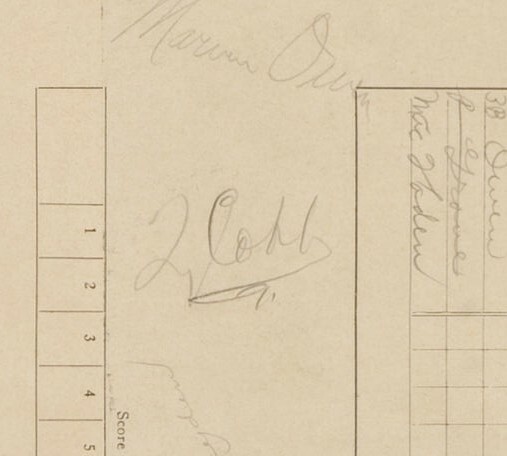 One of the first signatures we noticed as problematic was Cy Young’s (Top). Illustrated below the alleged Young signature on the Heritage item is an authentic Young signature signed on Induction Day in 1939 for a Cooperstown native. 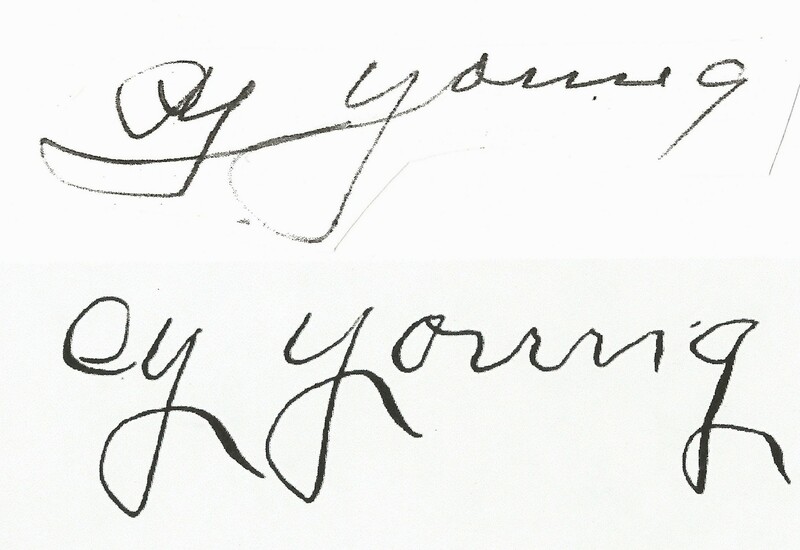 The contrast between the signatures is drastic and the forgery lacks any true resemblance to Young’s own signature signed in Cooperstown in 1939. 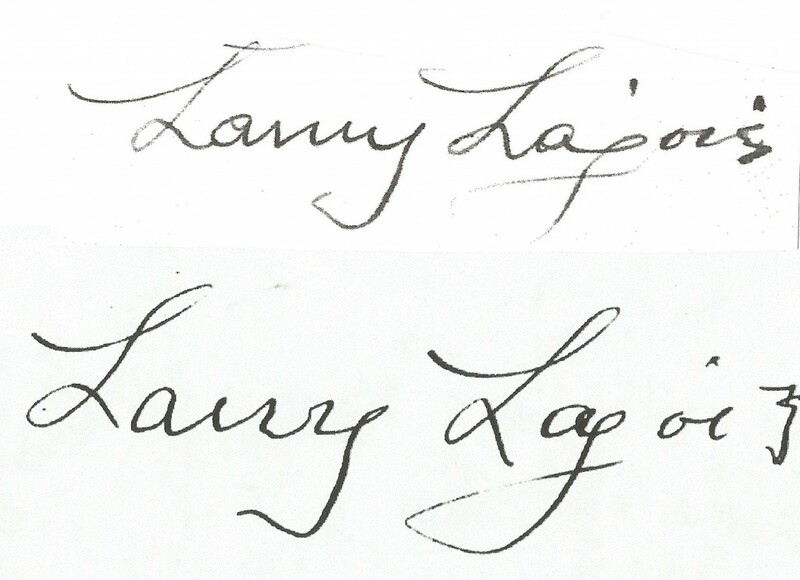 The next to show signs of forgery was the Larry Lajoie signature (top) which, while well executed, includes three “r’s” in “Larry.” The exemplar that appears below that signature is an authentic autograph of Lajoie also signed for a Cooperstown resident in 1939. On it’s own, with only two “r’s”, this forged signature would fool most everyone. 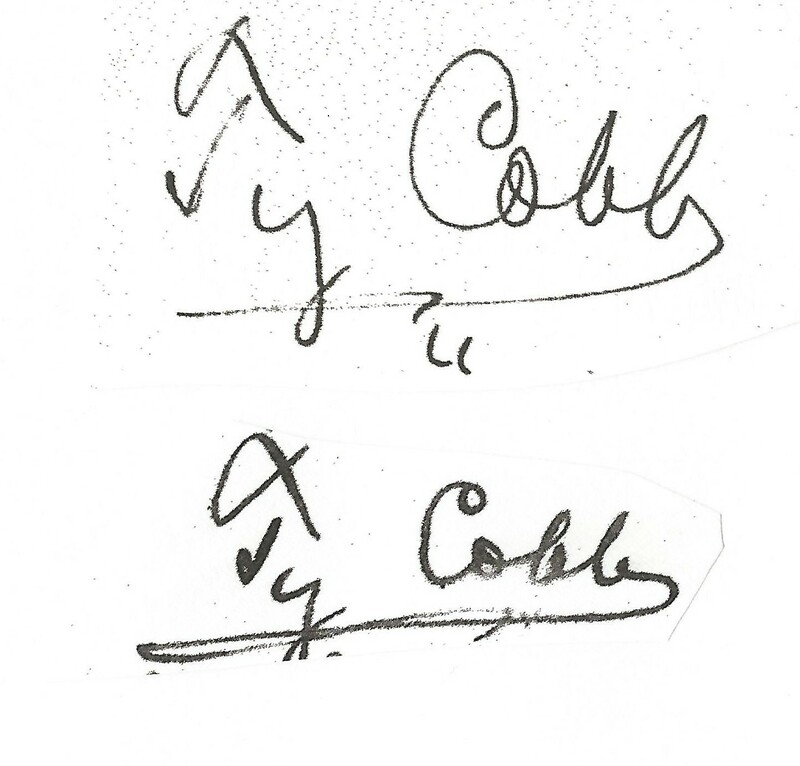 The Ty Cobb signature at the top of the Heritage Induction Day Program shows considerable contrast with other authentic Cobb signatures actually signed by the “Georgia Peach” in Cooperstown in 1939. The example at the bottom is considered authentic and appears on a 1939 Induction First Day Cover. 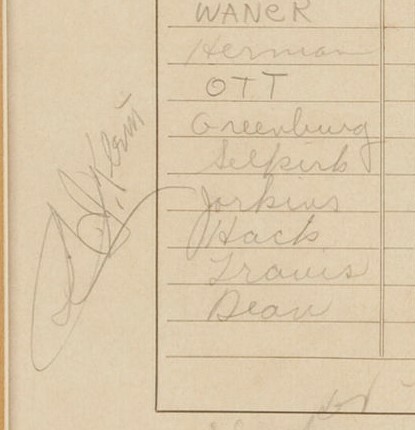 The Honus Wagner signature appearing on Heritage’s auction lot is, perhaps the best forgery of the bunch, closely mimicking the “Flying Dutchman’s” elaborate signature with fancy flourishes. In our opinion, close, but no cigar, when compared to another authentic example signed for a Cooperstown resident in person during the 1939 festivities in Cooperstown. The forgery shows signs of hesitation and an appearance of being drawn and lacks the natural flow of Wagner’s handwriting. 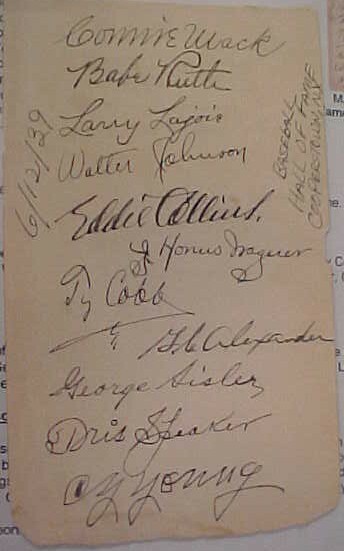 The alleged Babe Ruth signature appearing on the 1939 program is also well executed. The authentic Ruth signature that appears on the bottom was signed by Ruth on a First Day Cover signed in June, 1939. 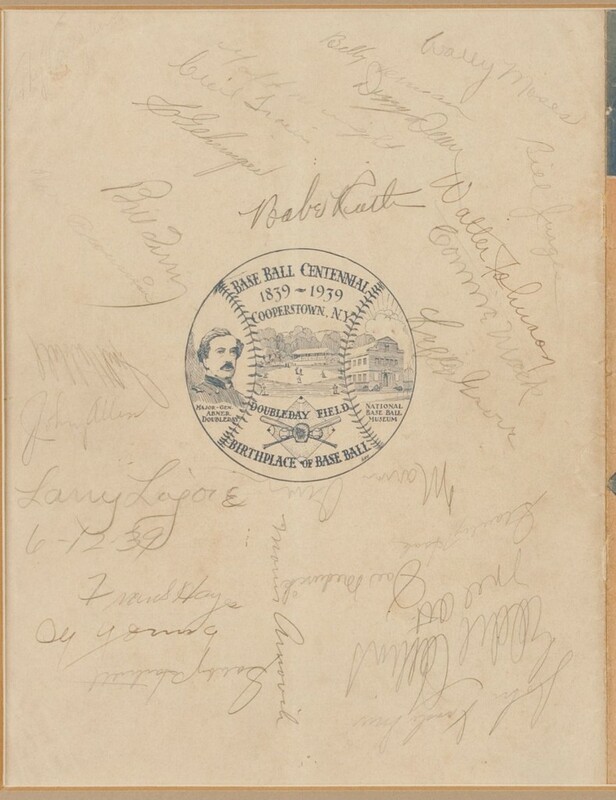 Another 1939 Induction program with alleged signatures of inductees and others. This item appeared in Heritage’s November, 2011 auction but failed to sell. Heritage offered the item with a “Full PSA/DNA LOA” and “an Auction LOA from James Spence Authentication.” The item is, however, riddled with unimpressive forgeries. We took note of one forgery in particular of Cy Young. It’s our “considered opinion” this forgery is a dead-ringer for the Young forgery executed on the $41,000 program. One would expect to see something like this item in a Coaches Corner Auction. 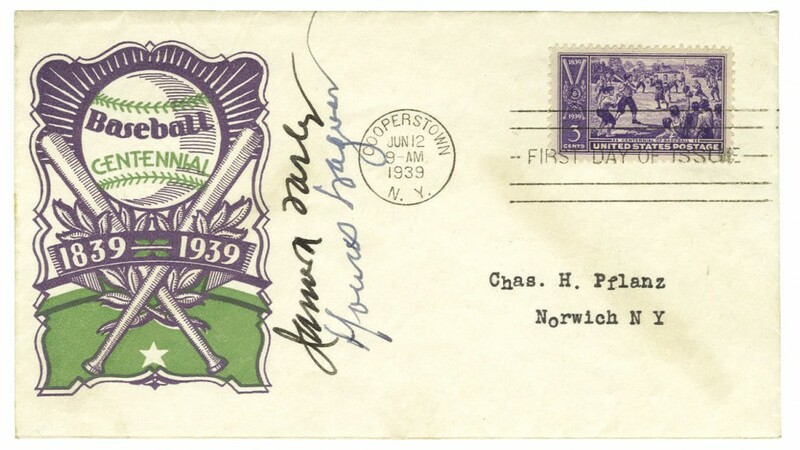 This 1939 Induction First Day Cover that also sold at Heritage features an authentic signature of US Postmaster General, James Farley, and a forged autograph of Honus Wagner accompanied with LOAs from JSA and PSA/DNA. 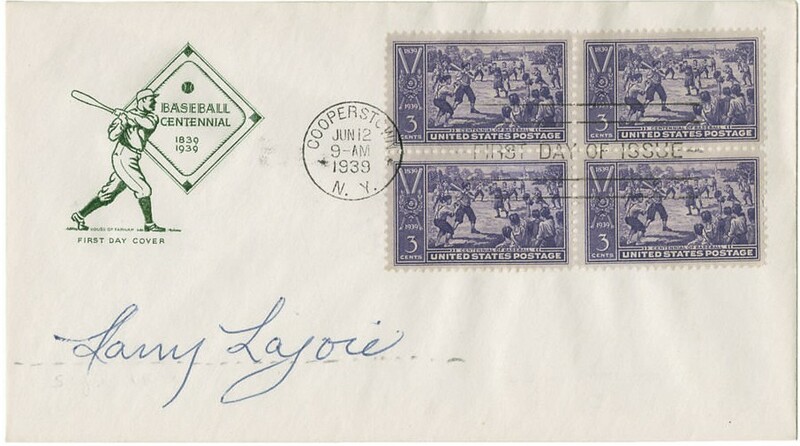 This 1939 Induction First Day Cover sold at Heritage and features a forged Larry Lajoie signature with an LOA from Steve Grad andZach Rullo of PSA/DNA. 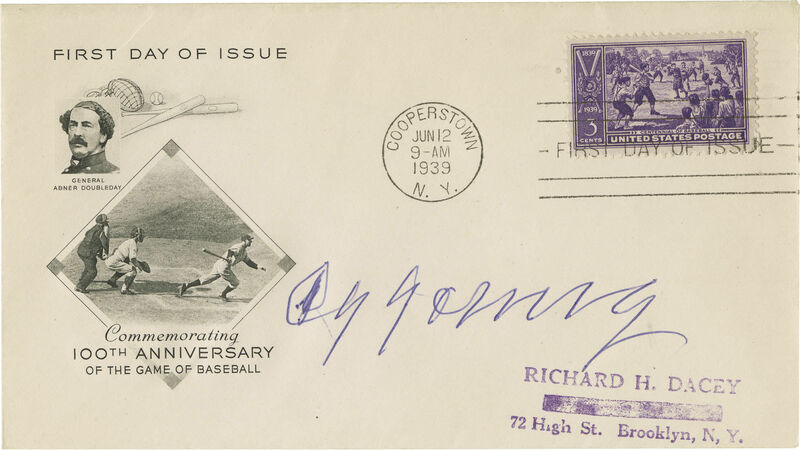 This 1939 Induction First Day Cover features a forged Cy Young signature. It sold for over $5,000 at Heritage with LOAs from JSA and PSA/DNA. For comparison, here is an Induction Day forgery sold by Coaches Corner with a Christopher Morales LOA. In our opinion, this forgery, certified by Morales, features better signature examples of Cobb, Alexander and Walter Johnson when compared to the 1939 program that sold at Heritage for over $41,000. In contrast, the Coaches Corner forgery sold for about $900 bucks. Not sold on our contention that these are all forgeries authenticated by PSA and JSA? Stay tuned for our next installment of “Operation Induction” and we guarantee you’ll never look at a PSA or JSA LOA the same way ever again. This forged signature of Hall of fame Umpire Bill Klem appears on the bogus 1939 Induction program pages being offered by Heritage Auctions. This Ty Cobb forgery is included on Heritage's 1939 Induction autograph lot. These forgeries of Larry Lajoie and Cy Young also appear on Heritage's 1939 induction lot that was authenticated by PSA and JSA. These forgeries of Babe Ruth, Walter Johnson, Connie Mack and Lefty Grove were authenticated by JSA and PSA for the upcoming April Heritage Auction. It would be helpful for lay readers such as myself to have a bit more explanation about how handwriting experts can spot these as forgeries. 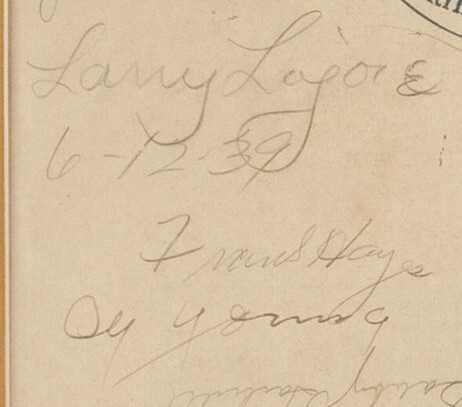 While the three r Larry Lajoie is obvious, and you provide some explanation for the Cobb, Young, etc autographs (the side by side photos are quite helpful), its not readily apparent in the others why you or the experts you consulted consider them forgeries. Perhaps I`m speaking too soon and all will be made clear in the next post, which I look forward to reading. Is the FBI interested in these forgeries? I know they are concerned with the robberies of historical baseball documents from libraries and other institutions. Sean,in answer to your question,it is easy to see the form of the letters,the forged ones from the real ones.Take for example the Babe Ruth,just look at the forged first B and the R and you can see the difference and it is as plain as the nose on your face.This is just a example of what is going on in the autograph market today and it is a shame how John Q Public is being ripped off, of their hard earned $,s. Thanks for your interest. Most of these forgeries were very well executed and standing alone would fool most. They even fooled the authentication companies all together. The Ruth signature was well done, but one problem that is very visible, as Herbie mentioned, is the construction of the “B”. The rounded loop in the center of the letter is very unusual and another give away. Also on the majority of genuine Ruth signatures the last stroke of the “B” forms almost a miniature “v” at the base of the signature, which is not present here either. The letter construction on the Cobb signature, in particular the “C” is off and the signature shows some hesitation uncharecteristic of Cobb . The experts we consulted with also have a good eye for the overall feel of the authentic signatures of all of these HOFers and they observed tendencies uncharacteristic of authentic examples. Without a real experts trained eye, its easy to be fooled by a skilled forger like this one. If the experts who work for the auctions get eleven different signatures of the first hall of famers wrong on the same item, are they really experts? They didn’t pick up on anything? What a fiasco! 1. How was the exemplar library for any particular individual assembled? What were the primary sources or references used; contracts and or similar legal documents? Of course I realize that the nature of a signature will change given the surface it is written on (flat vs round). I would also like to know how all of this tracked and identified to track changes in a person’s signature over time? 2. How much work goes into the evaluation and authentication of the manner of inscription? By this I am referring to both the physical implement (style of pen) or even the ink? I suspect pencils have not changed as much over time as pens. 3. How much work goes into the evaluation and authentication of the item the autograph is actually on? A. The autograph is consistent for the period in question as confirmed by a comparison with this known period exemplar (list what that exemplar actually is). B. The manner of inscription is consistent with the relative dating of the signature. (This goes back to how extensive and accurate the exemplar library is). C. The item the autograph was inscribed is a legitimate period offering and is or is not consistent with the period of the signature. Of course an item could be signed later than say one of the 1939 Hall of Fame Induction Programs, but an attempt should be made to document consistency. In my opinion, the autograph industry is what it is today because collectors have subsidized a system that appears to remain viable and profitable because of their continued willingness to accept “because I said so” as the standard; a sad but common thread this segment of the sports collecting industry shares with its game used counterpart. Buy and collect whatever you enjoy and are comfortable with, but I can’t help but think you would be happier and more comfortable with those items that are not just simply described, but have the process by which the opinion was reached documented so that you could make your own informed purchase decision. I don’t think they spend much time trying to figure out how the athlete signed versus established examplars from that time period. The 41 thousand dollar item features a ty cobb with a mushroom top Ty, while the item at heritage that failed to sell, features a Ty Cobb with the 2 variation of the word Ty. Now unless Cobb was switching it up back and forth for each collector during the 1939 induction ceremonies, this would seem to be a problem. How they authenticate remains a mystery, but I think they want it that way. What about ink analysis ( im no expert ), but is there a way to define when the ink was applied to the item? Is there an aging process? What a joke this hobby is. I saw the same article on the autograph alert website. It is a shame that this hobby is screwed because of greed and bad authenticators. I will not trust any authenticators from PSA, JSA, PASS,AAU,Todd Mueller, Steve Koschal, GA or any body associated with them. They are all a joke. If I’m going to buy autographs from dead hall of famers I would buy it from a expert on only that athlete. Why waste your money on opinions? Not one of the so called authenticators I mentioned are experts on every single athlete alive or dead. Most will make mistakes. I have quit buying autographs and I will not participate in this hobby again. It’s a joke!!!!!! I have to say this…..why can’t these be real???? Do we all sign our names exactly the same every time? I don’t….